Why Do You Need Your Tooth Extracted? Remember when you were a kid and you had a loose tooth? You waited and waited for it to naturally fall out but it didn’t happen. Until finally, after weeks of waiting, mum decided to take matters into her own hands. A string, and someone to pull hard at it – those were all she needed to finally yank out the wobbly tooth. You didn’t question mum about this decision. In fact, you were pretty excited about it as you couldn’t wait to get the tooth out. You just wanted to put it under your pillow for the tooth fairy. Now that you’re an adult, if your dentist says you need to have your tooth extracted you’d probably be full of doubts and have tons of questions. And you’d most likely find nothing amusing about this ordeal you have to go through. Here at Marsfield Dental Care, we want our patients to be fully informed before getting a particular procedure. When it comes to tooth extraction, here are the most possible reasons why it needs to get done. If you have a tooth with cavities or decay, dentists will try to treat this by doing a filling, crown repair, or a root canal. 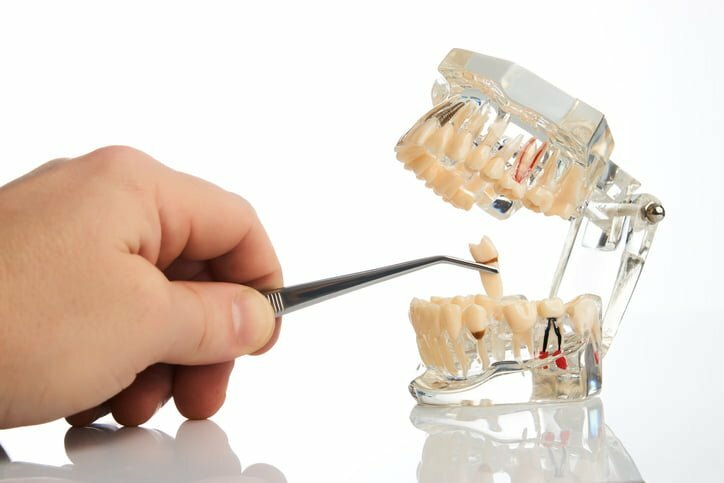 If however, the tooth is beyond repair and no procedure can be done to restore it, the dentist in Sydney may suggest a tooth extraction. Just make sure all other procedures have been considered and proven unhelpful before agreeing to get this procedure. Periodontal or gum disease happens when there’s an infection in the bones and tissues supporting the teeth. Having this, you’ll experience gum inflammation and in worst-case scenarios, teeth loss. If treatments and medications don’t work and teeth become loose, you will need tooth extraction to remove them. Some are fortunate not to experience the negative effects of wisdom teeth. However, there are many who unluckily experience pain, infection, and even tooth decay and damage to the nearby teeth because of a misaligned wisdom tooth. In cases like these, extraction is necessary. When you undergo treatments and take medications, sometimes these cause your immune system to weaken and there’s a risk of developing a tooth infection. This may happen when undergoing chemotherapy or organ transplantation. During these times, your dentist might also suggest a tooth extraction. Discuss with your doctor if the procedure is something you need to do. When you need to get braces, retainers or plates there’s also a possibility that you’ll need to have tooth extraction. The mouth needs to be prepared for these orthodontic procedures. If you have a crowded mouth or have teeth that are too big, an extra space will need to be created for proper teeth alignment, thus the procedure is necessary. These five conditions are all possible reasons why you need tooth extraction. Talk to Dr Mary Choo, our resident dental expert at Marsfield Dental Care, to learn more about these conditions and about tooth extraction. When we were kids, everything was easier and almost everything, even getting our tooth pulled out, gave us a reason to smile. We can still follow this philosophy in life. But when it comes to tooth extraction, we need to ask the right questions and not just blindly follow what our mum or dentist tells us. Having teeth out no longer necessarily means a lifetime of soft food or dentures. These days we have access to technology and techniques to aid in replacing lost teeth so that your aesthetics and function can be maintained. These may include bridgework or even dental implants. If you find that missing teeth has affected your confidence, diet and function, let us know at Marsfield Dental Care so we can tailor a treatment plan that is specific to your goals. We also have an emergency dentist in Sydney to take care of your immediate dental needs. You can visit our dentist at Epping Road or contact us at (02) 9887 1961.